So, this weeks challenge is white. No black and white photos accepted, photo must clearly show a human face and have white in the image. Hmmmm - perfect! 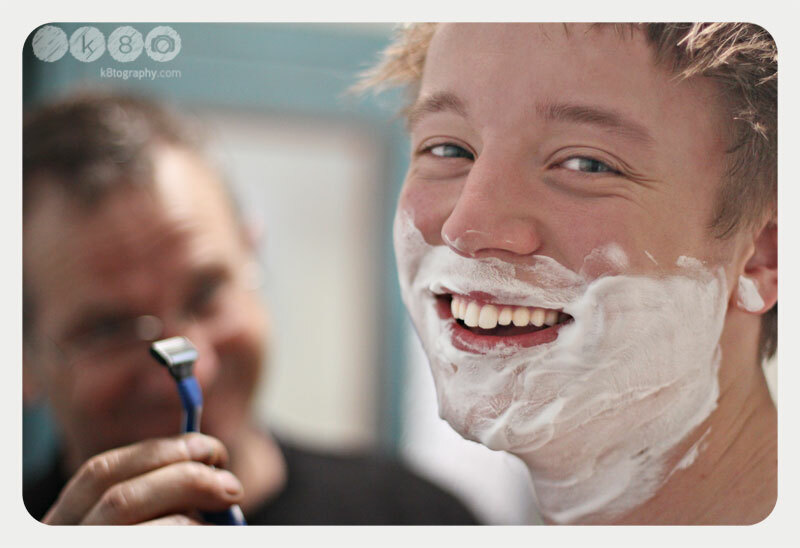 My just turned 17 year old son decided that he had to have his first shave after months and months of us nagging. In our small bathroom 4 of us crowded - my husband (chief shaver), said son (shavee), daughter/sister (curious looker-on-er-rer) and me (life recorder). Such a momentous occasion can not be left to go undocumented so in I squished with the camera and snap! snap! snap! I got loads of images. The image below is the first one I took. I adore the look on his face and I love that I got his dad (chief shaver) in the background looking ready to go! Head on over to i Heart faces and check out loads of other 'white' images..... please leave comments on participants blogs - it is very exciting to come back and read that others liked (or didnt) your submission! Meet Finn aka Finnie aka Finnbar aka Handsome aka Hanny Some! He is our Golden Retriever x Samoyed dog that we have had since he was 9 months old. He is now 16 months old and we love him dearly. I have plenty of photos of him - so many divinely gorgeous ones, lots of funny ones - some of him swimming, jumping you name it - I have it but, even though there did not have to be a human face this week, I just couldn't resist posting this image below. Here he is with my daughter Bronte. They both have a lovely bond. She loves to carry him around and he loves it too! He is nearly 30 kilos in weight and he hops up onto her back (or front) willingly and easily. She piggy backs him around the house and whilst on her back he loves a good munch on her ponytail! 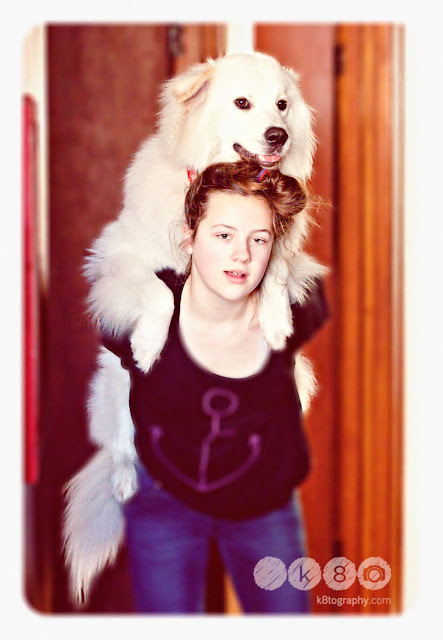 It is such a sight to see - this big polar-bear-like dog being carried around (and enjoying it) like that. I love these two kids! Want to see loads of cute animals of all types? Head on over to I heart Faces and check them all out!